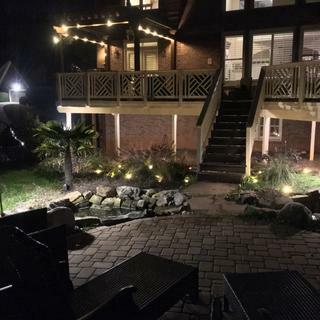 Add light to decks, outdoor seating areas, yard settings and more with this plug-in, line-voltage landscape light that creates a 50-foot circle of light. This portable unit stands nearly six feet high and makes outdoor lighting easy! 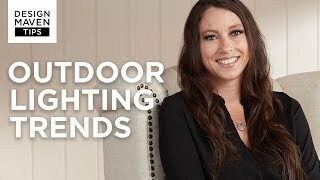 It plugs into any outdoor outlet for lighting around decks, seating areas or along a pathway. The light comes with a sensor that automatically turns light on and off at sunset/sunrise. With sturdy, all-metal construction. Line voltage lamp; not compatible with low voltage lighting systems. 68" high. 50 foot circle of light. 10-foot cord. Includes one 13 watt CFL bulb with glass bulb shield. Can take one maximum 25 watt standard base bulb. Includes a dusk-to-dawn photocell that automatically turns the lamp on at dusk and off at dawn. Easy to use, plugs in to any outdoor outlet. Sleek black finish; a great design for seating areas, patios, BBQs, or decks. Includes attachable stake for uneven terrain if needed. On/off button that can override the dusk-to-dawn feature for better control. Auto on-off sunset to sunrise operation. We have 4 of these lamp (2 in our front yard and 2 in our backyard). They add such a great atmosphere and lighting element, as well as there is no need to remember to turn them on - they go on as darkness sets in. This purchase is actually a Christmas gift for friends who have wanted one for years. Very happy to be able to get this for them. Looking to light up the tall flowers in my flower garden. Saw something similar at Butchart Gardens in Victoria, BC. we bought this 2 years ago and it got wiped out in Hurricane Matthew...forgot to bring it inside. We really liked it and decided to buy it again. I have bought this item previously, and have been very pleased with the lamps. I have gotten many compliments from my neighbors as to how the lamps look at night. Can you use LED lightbulbs with this lamp? BEST ANSWER: yes I have 3 of these lamps, had them for 5 or 6 years and just logged on to order another. I have use led 60 watt soft white bulbs with no problems. Only changed them once and they were not even burned out after being on every night dusk to dawn. I love these lamps but even with the stake in the ground I like to put a couple heavy rocks on the base for extra stability. BEST ANSWER: I didn't want to pull it apart to measure the diameter but did measure the circumference. The tape going around the post measures 3 3/8 inches. Hope this helps. It will definitely fit into an umbrella stand. I would say the post diameter is approx 3/4"(no more than an inch) in diameter. BEST ANSWER: The base is flat and pretty heavy. You don't have to stake it into the ground. We have ours on a solid surface and put a couple of heavy rocks on the base that actually look nice. We get some very strong winds here so wanted to take the extra precaution. It hasn't moved even with heavy winds. Just a metal base no stake but I’m not sure if they would stay put in wind. I use them in my flower garden and stake them down. This lamp is awesome I've bought 6 of them you could stand it on concrete without putting the rod that goes into the ground. How do you change the bulb? BEST ANSWER: Unscrew the protective clear glass globe. You will then be able to access the light bulb and change it like any standard light fixture. Thanks for the reply - it was stuck on there, like maybe it had been glued, and I ended up breaking the whole lamp trying to unscrew it from the top. i just unscrewed it. trick question ? BEST ANSWER: The cord for this plug-in landscape light is 186 inches. Is there a power cord running out of the bottom of the unit that is not shown in the photograph? How does it plug into an outlet? BEST ANSWER: Yes. The power cord is I believe 10 feet long and plugs into a regular receptacle. When you put it together, which is pretty simple, you can see the cord runs through the pole from top to bottom and comes out the bottom. Yes, there is a 10 foot cord that runs out just above the base. You can plug this into any outlet or extension cord. Yes, there is a power cord attached to this which you’ll need to plug into an outlet. The cord comes out of the side of the pole about 8” from the bottom. Yes, there is an 8-10 ft cord from the lamp that plugs in. Can you replace the bulb with a standard LED bulb? BEST ANSWER: Yes. This fixture uses any standard GU24 based bulb, including LED options. Can the auto on/off sunset to sunrise operation be turned off? BEST ANSWER: The easiest thing to do to by-pass the auto on/off is to cover photocell eye. Dark tape or paint should be enough to cloud the eye. Other than that the light would have to be taken apart and rewired to by-pass the auto on/off. By covering the "eye" the light would stay on all the time. Hopefully this answers your question. What is the total width of the unit and of just the shade? BEST ANSWER: The total width from the pole to shade is 17” and the shade alone is 13 1/2" W.
Does this lamp come with a base for use on a floor? BEST ANSWER: It comes with the flat base pictured. I have it standing under the edge of an area rug so the flat base works well. this light is great, tall enough not to get buried in the snow. Very well made. Can just plug it in. It really does shine light for 50 feet around it. Better than a solar light, stays on from dusk until daylight. EASY TO ASSEMBLE;TIGHT FITTING JOINTS; SOLID WELL BUILT, INDUSTRIAL STYLING, HEFTY WEIGHT AND ATTRACTIVE. INSTALLED IN LESS THAN 15 MINUTES. RECOMMENDED 25 WATT BULB ONLY. VERY STURDY AND WILL NOT BEND. 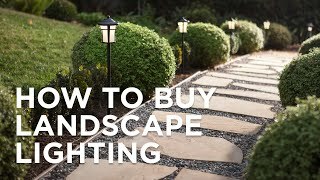 I HIGHLY RECOMMEND FOR ATTRACTIVE YARD, PATHWAY, OR HIGHLIGHTING AN AREA OF THE YARD. Bought three lamps to use in my small backyard so garden is visible at night. Beautiful impact; high quality; well-made. Better than expected. We have a screened in porch that will get wet in very bad weather. Regular lights just didn't cut it - they got rusted or ruined. Or we had to carry them in and out every time to protect them. These are PERFECT. They are very solid and well made, and they sit high enough to throw out plenty of light, and they are completely weathertight and nicely powder-coated, so they shouldn't rust. 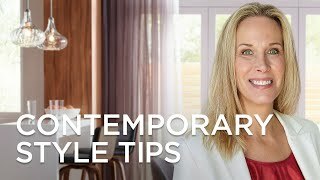 You MUST use low wattage CFL bulbs with these - the bulb is sealed inside a glass dome so securely that a higher wattage, regular incandescent bulb would generate too much heat. 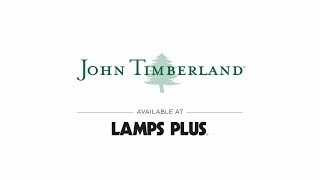 They include one bulb, but it is a standard size and throws out plenty of light. We have two of them - placed on either side of the couch and we finally have the decent, weatherproof lights we have always wanted for the porch. You definitely can use these on a porch, they aren't just for outdoor landscape applications. I've been looking for something like this for years, I'm glad I finally found it. This lamp is great. I wish that it came in smaller sizes. We have been wanting a light in the center island of our circular driveway for a couple of years. We kept putting it off as it would be time consuming to concrete a post in the ground for the typical lamp post. When I saw this, it was perfect! Set up was so easy and inexpensive compared to our original plan. It lights up the area beautifully. Another great feature is the built in dusk to dawn. If we decide on a change, it can easily be moved to another area. Thank you. Shipping was quick and everything was well packed. WOW super heavy duty, long solid steel spike to plant(secure)the post into the ground or it also has pre drilled holes if you want to set into concrete base on bolts or other solid surface. very very easy to put together. i used a bar of soap on the threads to ease the threading. I like that it is portable for an outdoor light. 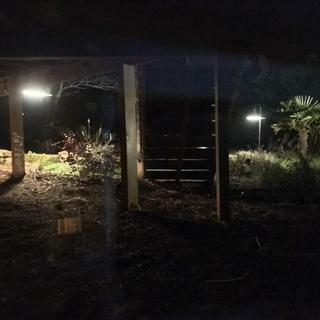 Solar lights don't really illuminate enough-especially in area with little to no sunshine. The dome shade is bigger than I expected and it took sometime to get use to it. It seemed disproportionate but is still nice. Putting it together was simple until one of the pole pieces would not easily screw into each other. It took 3 - yes 3 men to screw the pieces together because the threads did not seem to fit. I did not want to have to send it back but that was the only issue. I bought this product based on the reviews but I have since found out that the quality of the lamp is terrible. 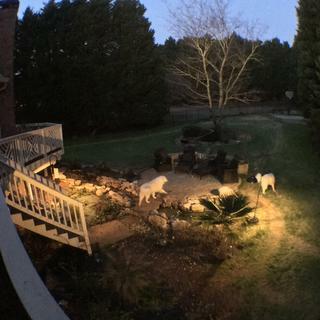 I purchased a total of 15 lamps to illuminate an elevated walkway and deck area. Two of the lamps failed within a week of installation. I contacted Lamps Plus to see if it was possible to get replacement bulbs (although replacing the bulbs would be very difficult) and I was told that they would send me two entirely new lamps instead. When the replacement lamps arrived one failed within a day of being connected. In addition four more lamps in the original order have failed and another is about to fail. The lamps have only been installed for about a month. If Lamps Plus finds it easier and more cost effective to replace the entire lamp if it fails then the product is way overpriced in the first place. Don't bother getting this light, it's a piece of junk. I like the way this is made: heavy-duy long cord, heavy base, well-shielded components. The unpacking experience was quite a pain, as white foam went everywhere. And the nut that secures the stake was missing, so I had to find one in my workshop. I particularly like the on-off switch. The claim of 50-feet of coverage is way too generous to me, even after I switched to an LED light. This LED landscape light kit comes with four black path lightstwo black spotlightsa free 45-watt transformerand low-voltage landscape wire. Stay up to date in design and technology with this silver finish solar LED outdoor landscape light. Increase safety and limit liability in commercial establishments or apartment complexes with this good-looking bollard in titanium finish.